This text is taken from an interview conducted on August 19, 2015 with CounterPunch Radio host Eric Draitser on WBAI 99.5 FM New York City. WBAI: In the past decade, America has quietly expanded its military presence throughout Africa. Take us there as a starting point and educate us. Eric Draitser: The last decade is a good timeframe to discuss this because there have been such significant changes both in terms of what’s happened on the continent of Africa, and in terms of how the United States and its military establishment have responded to that. 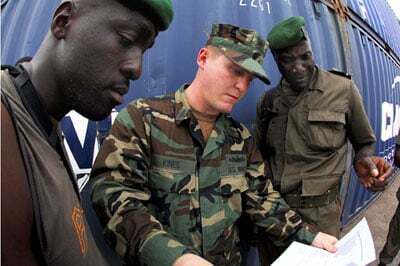 People may remember, or they may not in fact, that back in 2007 towards the end of the Bush administration we had the establishment of the US military’s so-called Africa Command (AFRICOM). And from its humble beginnings, so to speak, in terms of “cooperative security arrangements” and “counter-terrorism,” AFRICOM has quietly expanded to become a continent-wide military footprint that the United States uses for all sorts of goals. In fact, the US military establishment has insinuated itself in almost every single country on the continent with the exception of two (Zimbabwe and Eritrea). And so, although it doesn’t receive much media attention, though it doesn’t get much fanfare, the United States has deeply penetrated Africa militarily, and is directly engaged in every important conflict on the continent. Whether you want to discuss the US-NATO war on Libya in 2011, the United States was a principal part of that conflict. The US is deeply engaged in West Africa, both in terms of the so-called counter-terrorism operations against Boko Haram, as well as being a principal participant in the conflicts around the Lake Chad basin. It has deep penetration in the Sahel region both with counter-terrorism and surveillance. And we could go on and on. The point here is that anywhere you look in Africa the US military is involved. And so, in understanding the changing nature of US engagement we need to understand both western corporate interests (resource extraction, investment, etc. ), as well as its military engagement and all the pretexts with which it justifies that. In looking at the issue in this way, one begins to get a comprehensive understanding of just how deeply involved the US and the former colonial powers really are in Africa. WBAI: The motivation, we are told, when we do discover or realize this penetration, is fundamentally humanitarian. It’s there to assist in counter-terrorism, such as you mentioned with Boko Haram and the kidnapped schoolgirls, etc. Please educate us more deeply about the motivations, the places, and the substantive issues that have brought the US to furthering its military foothold throughout Africa. ED: Sure. Boko Haram is one that happens to get a lot of headlines because of the grizzly attacks, the kidnappings of the Chibok girls and others, the massacres at Baga and elsewhere, and all the rest of that organization’s violence. Certainly it warrants that attention, although if we have time, I could go more deeply into the fact that the corporate media won’t touch the real issues behind Boko Haram: where it comes from, its murky beginnings, and the shadowy networks that it operates within. But also, beyond Boko Haram, we remember quite recently the Ebola scare in West Africa which provided a very convenient pretext for the United States to send so-called “military advisers” along with military medical equipment and facilities, providing a cover for continued military engagement and, interestingly enough, a lot of those military forces are still there. So, of course, you see there are a number of pretexts that the US uses to justify its presence. If we remember back to 2012-2013, in the wake of the US-NATO war that overthrew the Libyan Arab Jamahiriya government of Muammar Gaddafi, there was a steady flow of weapons that went west and south, and those weapons, and some of those fighters, ultimately led to the overthrow of the government in Mali which led to a war in that country. That war then precipitated an intervention by the former colonial master France, backed naturally by the United States. And, in fact, US military personnel were engaged in Mali well before the overthrow of the government. So you see, all throughout West Africa and the Sahel region you have US military involvement. It should be noted though that the US presence is not limited to active troop presence and active military engagement. Allow me to provide just a few examples. In the nation of Chad, the United States has indefinitely stationed a contingent of troops. In fact Chad, a very important nation because of its strategic location – south of Libya, east of West Africa, situated in the Lake Chad basin and the Sahel region – was the host of the US military exercise known as Flintlock 2015. This US-sponsored series of military exercises included the participation of the nations of Chad, Niger, Nigeria, Cameroon, and Tunisia. Each of these countries hosted US military personnel as an outgrowth of this comprehensive international military exercise. But of course the US presence is not limited to simply such exercises. The Washington Post reported the establishment of a major new US drone base in the nation of Niger. This base is designed to be the drone and surveillance headquarters for the entire Lake Chad-West Africa-Sahel region. Consider very carefully what such a base means; it means that the Washington has “eyes in the sky” throughout the whole Boko Haram conflict zone and the entire Lake Chad basin, extending upwards into North Africa, to the western edge of West Africa and south into Central Africa. So, when the US claims that they have no idea what’s going on with Boko Haram and are in the dark about what’s happening in the Lake Chad basin, this strains credulity. But it doesn’t stop there. The United States has “staging outposts” – they won’t call them military bases for obvious propaganda reasons – in the nations of Ghana, Senegal, and Gabon. It also has allies such as Germany and France with a presence in those countries. And then of course the US has a major hub in its surveillance network in the nation of Burkina Faso as was reported by the Washington Post back in 2012. I’m really only scratching the surface here. We could talk for hours and hours about all the different military facilities all over the continent which they have penetrated so deeply, and of course the reasons behind this penetration. And as I mentioned earlier, the reasons are complex and multi-faceted: it is about geopolitics, economics, and strategic military engagement. WBAI: Could you give us a summary of some of that? How do the neocolonial powers use debt as a weapon against Africa? How does the US use the military in this contemporary neocolonial context? At one point I know you had posited to me off air that to some degree this is done to block the growing influence of China in its development and engagement with Africa. Could you lay some of that out for us? ED: Ultimately the geopolitics is central to all of this. Looking first at the debt issue – the United States and its neocolonial allies France and the UK primarily (but not exclusively) have maintained their hegemony over their former colonial possessions through the mechanism of debt. I don’t think this is a secret to anyone who has followed the politics of Africa in the postcolonial period. This is something that is well known and well-studied. They use the mechanism of international finance through the International Monetary Fund (IMF) and the World Bank; the main levers are debt financing and debt servicing. That is to say, they provide financial assistance to these countries that is never really payable, forcing these countries into the vicious cycle of paying back the debt, and the interest on the loans. So the indebted countries are then forced to take new loans to pay back the original loans, further indebting themselves, thereby stunting their own economic progress for years to come. Not surprisingly, those countries that have attempted to either repudiate debt, or that have at least called it what it is and tried to find a way out of that cycle of debt slavery, have been destroyed, had interventions or assassinations or coups. One could look at Thomas Sankara in Burkina Faso, or even Muammar Gaddafi in Libya. Many of these countries that have done something to get out of that economic enslavement have found themselves in worse situations because of the reactions of the neocolonial countries of the West. And this is really the main issue here: the US and its allies want to continue to maintain hegemony over Africa financially for the purposes of exploiting resources – extracting the wealth of Africa and shipping it back to the colonial powers, something that’s been going on for centuries, albeit this is a somewhat new form and under the guise of legal, neoliberal capitalism so to speak. But also, the expansion of hegemony is done for the purposes of blocking China. The Chinese have engaged economically all throughout the continent, this has been the unmistakable trend over the last decade or more. Just to give an idea of the scope of what China has invested in Africa: in 2000 China’s total investment in Africa was roughly $10 billion for all of Africa, by 2012 it had risen to more than $165 billion, a fifteen-fold increase. This gives you an idea of the importance of Africa to China’s investment growth, and how it views its future in terms of financial engagement on the continent. One of the reasons China has become such an attractive investor to these African countries is because the Chinese model is decidedly different from that of the US and the western powers. Specifically, the Chinese don’t view aid in terms of loans, grants, or charity. Rather, they view financial aid in terms of mutually beneficial cooperation – win-win investment as the Beijing sometimes calls it. To be fair, there are of course instances of corruption, some negative byproducts in terms of uneven distribution, environmental degradation, and other effects which come with all forms of investment, regardless of who’s doing the investing. But what the Chinese offer is hard investment in infrastructure: roads, factories, airports, railways, ports, satellite and telecommunications networks, etc. that are required for them to get a return on their investment and to be able to further expand their economic investment on the continent. And China does so without that negative product that the African people are so justifiably afraid of: debt. In other words, when the Chinese come in to make an investment, they do so without the debt albatross to hang around the necks of African nations. There are no loans to be serviced when the Chinese are done with their investment. And this is one of the reasons why almost every country in Africa views China as a viable alternative to western financial investment and “aid.” And this is the danger that the US sees here. The US knows, quite frankly, that because of its own economic issues and those of Europe as well, that it simply cannot compete with China in terms of investment in Africa. So, what the United States has chosen to do, and this is clear from the policy decisions and military engagement all over the continent, is to check Chinese economic penetration with military penetration. And that is really the overarching issue here: the US uses its military everywhere on the African continent to block Chinese economic engagement, penetration, and influence. WBAI: I’d like to get back to the US-NATO war on Libya in 2011 which was a major force of destabilization. You’ve contended that this was a turning point for Africa. Could you elaborate? ED: Absolutely. In fact, calling it a turning point might be understating it. It was a watershed moment of world-historical importance because the destruction of Libya – I would call it an imperial war on Libya – really set off a chain of events the effects of which we’re still seeing today. When the United States and its NATO allies destroyed Libya, they destabilized the entire North African region. As I think I mentioned briefly earlier, the weapons and fighters from Libya flowed both west and south; anyone looking at a map can see quite obviously what the effects of that would be. As those weapons flowed west, they went into West Africa and into the Sahel, and when they went south they went to Chad. Those weapons and fighters that went to Chad, many of them are now engaged in the conflict we’ve come to know as the war of Boko Haram. The networks from which Boko Haram has sprung have been based in Chad, this we know from WikiLeaks cables that we’ve now seen. Many of these fighters get a lot of their financing and weapons funneled through Chad as well as certain elements in Nigeria. Their staging areas are also in Chad. So, a lot of those weapons went into that conflict there. Many of the weapons and fighters also went into Mali. The war in Mali and the overthrow of the Malian government was a direct outgrowth of the war in Libya, many of those fighters filtered back into Mali, they picked up their weapons and engaged in their continued war which had been going for a number of decades. Terrorism arose within that maelstrom. We saw the emergence of the terrorist organization known as Ansar al Dine led by a shadowy individual known as Ayad Ag Ghaly who has deep connections to the Saudis and Qataris. Ghaly led the terrorist insurgency in Mali which then necessitated a French intervention in order to restore order. So we see at least two separate wars in Mali and Nigeria that can be described as a direct outgrowth of the war on Libya. Of course, there’s also the continuation of Al Qaeda in the Islamic Maghreb (AQIM), a very shadowy terrorist organization, also has its contemporary roots in what happened in Libya in 2011, though the group existed well before that war. Many of the fighters from Libya have become guns for hire in criminal organizations such as AQIM and others in the region. So in Libya, the flow of weapons, the flow of fighters, out of that country destabilized the entire region. And I should reiterate that this is not exclusive to Africa because many of those fighters who were veterans of the war in Libya not coincidentally found their way into Syria, and have acted as mercenaries in the four and a half year war on Syria. Clearly, there are deep shockwaves that emanated from the war on Libya, and are still being felt today all throughout North Africa, West Africa, as well as the Middle East. I would contend that this was not unpredictable. Many of us, including myself, were saying that this is exactly what would happen if the United States wages this war on Libya. That’s precisely what happened. And if you think that the strategic planners in Washington had no concept of that, I’d say that’s deeply naïve and misguided. I think that they understood perfectly that by destabilizing and destroying Syria, they could expand the chaos throughout the region which, going back to what I said at the beginning of this interview, provides the justification and pretext for expanded US military engagement, precisely what they’ve wanted all along. WBAI: In the remaining time that we have Eric, how do you analyze Obama’s recent trip to Kenya and Ethiopia? ED: Well, I think that this was an act of desperation what we saw in both places, evident on the face of Obama, because in both countries the US is now being outstripped by China in various ways, especially in Ethiopia. This is very interesting because Ethiopia has historically been a US proxy state for the last few decades, acting as Washington’s “cop on the beat” for the Horn of Africa. The fact is though that Ethiopia is increasingly turning towards China. One of the main examples of this shift is the massive new dam that the Ethiopians are building on the Nile with Chinese funding and Chinese expertise. Although the project has certain negative environmental consequences, it is in many ways a major development for Ethiopia, a country in which the majority of the population still lives without electricity, where the infrastructure is dilapidated to the extent that it exists at all, which is deeply backwards in terms of its development. And the Chinese have come in and offered this massive project, and the Ethiopians have jumped at it. The United States is deeply concerned that it will lose its foothold in the Horn of Africa if the Ethiopians become direct allies with China. And so, what you saw with Obama was a historically significant moment: the first time a US president has gone to Africa and openly said that the US offers Africa a better deal than does China. In other words, open and overt recognition that the United States is in open competition with China for influence in Africa. This is something many people have written about, many people have known. But for the US president to say it openly on an official trip to Africa is, I think, quite significant and quite telling of the desperation that Washington feels. The other thing we saw on this trip was Obama’s speech in Kenya when he was standing there shoulder to shoulder with Kenyan President Kenyatta. Obama was talking about American and Western “values” and the importance of “values” referring to things like recognition of the rights of LGBTQ individuals, what might be called “secular western liberal progressive values.” But what we saw was a rejection not simply of those specific values, although we saw that as well, but also a rejection of the US dictating the terms of African cultural, social, and political development. What President Kenyatta said – first of all it should be noted that Kenyatta ran on an anti-International Criminal Court platform, against the validity of the court itself, arguing that it had been made into a tool of the US and the West to prosecute solely African people, thereby becoming effectively the International Criminal Court for Africans. That the court itself is white supremacist, colonialist, and racist at its very core…and I entirely agree with Mr. Kenyatta’s assessment and analysis. And so we’ve seen a shift in terms of African perceptions and perspectives towards both the United States, and the western political and economic institutions that it dominates. So when Kenyatta was standing there with Obama, he was not only rejecting the notion that the US should dictate values to Africans, he was rejecting the very idea of western hegemony in Africa, and I think that that is really critical. Although Kenya works with the US on a number of issues involving peacekeeping and many other things, you’re seeing a major shift in terms of perspective and in terms of values and understanding the role that the United States plays in Africa. And I think that that’s really critical because that is a turning point. Africans want independent development – independent political and economic development. And that is what we’re seeing. The more the better for Africa. WBAI: Eric Draitser, thank you for this comprehensive analysis which we will continue to dive into in the weeks and months that come. Thanks for getting up with us this morning. ED: Thank you for having me. The above text is taken from an interview conducted on August 19, 2015 with CounterPunch Radio host Eric Draitser on WBAI 99.5FM New York City.